These and other pressing questions are answered in the The Field Guide to ADHD: What They Don’t Want You to Know. Harding confronts with unusual candor and painstaking effort one of the most alarming and perilous crises of our time: ADHD. In confronting this crisis, Harding forces us to reconsider the assumptions underlying ADHD and how we think about medical diagnoses, disability, health and authority. Harding unwraps these bewildering and conflicting ADHD issues while investigating the spiraling amount of overdiagnosed cases of ADHD, many often highly medicated and taught to conform rather than to thrive, no matter the individual or societal cost. Harding examines how the ADHD crisis drives perilous and dangerous conditions while providing fresh directions ahead to disarm this ailment and start harnessing ADHD as a beneficial form of human diversity. 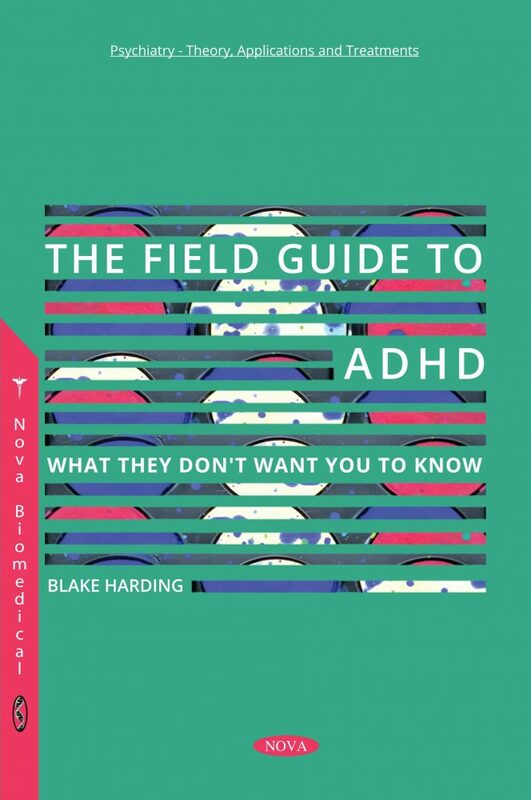 In this fresh approach to ADHD, results from more than four years of global field research from Finland to California investigating ADHD in children, adolescents and adults is woven together to create a fascinating tapestry of new ADHD understanding. In this new understanding, Harding provides everyday innovative approaches to harnessing and thriving with ADHD while dedicating pain staking effort to shedding insight into the many controversies igniting the ADHD crises. As Harding passionately argues, policy makers, healthcare professions, parents and other stakeholders are not only supporting the overdiagnosis of ADHD, but fundamentally thinking about ADHD all wrong. 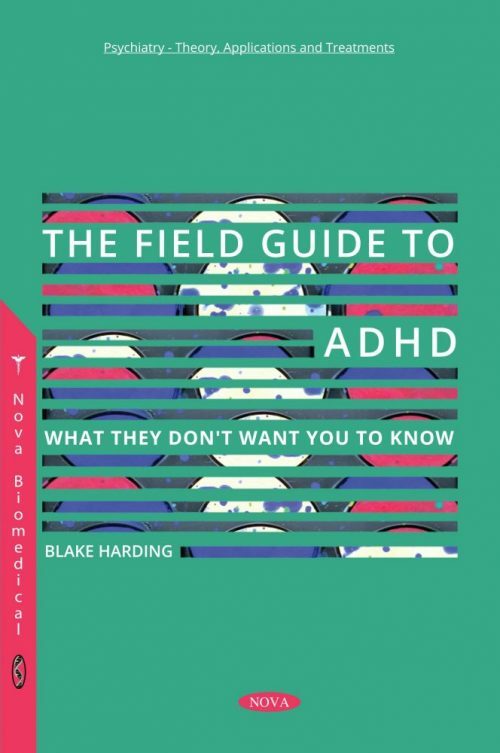 The Field Guide to ADHD: What They Don’t Want You to Know passionately intervenes in this wrongly handled situation by forcing people to reconsider ADHD assumptions, providing evidence based directions for containing the perilous ADHD crisis and introducing highly impactful everyday solutions to harness the diverse benefits of ADHD. Alaheino, L., and S. Leppämäki. “Prevalence of ADHD Symptoms among Adults in the General Population in Finland.” European Psychiatry 41 (2017): S352. American Psychiatric Association, and American Psychiatric Association, eds. Diagnostic and Statistical Manual of Mental Disorders: DSM-5. 5th ed. Washington, D.C: American Psychiatric Association, 2013. Archer, Dale. ADHD Advantage. Penguin Publishing Group, 2015. Armstrong, Thomas. Neurodiversity: Discovering the Extraordinary Gifts of Autism, ADHD, Dyslexia, and Other Brain Differences. ReadHowYouWant. com, 2010. Ball, Stephen J. Foucault, Power, and Education. Routledge, 2012. Bandura, Albert. “Perceived Self-Efficacy in Cognitive Development and Functioning.” Educational Psychologist 28, no. 2 (1993): 117–48. ———. “Self-Efficacy Mechanism in Human Agency.” American Psychologist 37, no. 2 (1982): 122. ———. “Self-Efficacy: Toward a Unifying Theory of Behavioral Change.” Psychological Review 84, no. 2 (1977): 191. Barkley, Russell A. ADHD and the Nature of Self-Control. New York: Guilford Press, 1997. ———. “Behavioral Inhibition, Sustained Attention, and Executive Functions: Constructing a Unifying Theory of ADHD.” Psychological Bulletin 121, no. 1 (1997): 65–94. doi:10.1037/0033-2909.121.1.65. Barkley, Russell A, Kevin R Murphy, and Mariellen Fischer. ADHD in Adults: What the Science Says. New York; London: Guilford, 2011. Benoît-Lamy, S, P Boyer, Marc-Antoine Crocq, Julien Daniel Guelfi, Pierre Pichot, Norman Sartorius, and American Psychiatric Association. DSM-IV-TR: manuel diagnostique et statistique des troubles mentaux. Issy-les-Moulineaux: Masson, 2005. Bentham, J. Panopticon; Or, The Inspection-House: Containing The Idea of a New Principle of Construction Applicable to Any Sort of Establishment, in Which Persons of Any Description Are to Be Kept under Inspection: And In Particular To Penitentiary-Houses, Prisons, Houses Of Industry, Work-Houses, Poor Houses, Manufactories, Mad-Houses, Lazarettos, Hospitals, And Schools: With A Plan Of Management ... Payne, 1791. https://books.google. Bentham, Jeremy, and Alexander Taylor Milne. The Correspondence of Jeremy Benthamn Volume 4, 2017. Berger, Peter L., and Thomas Luckmann. The Social Construction of Reality: A Treatise in the Sociology of Knowledge. New York: Anchor Books, 1990. Bernfort, Lars, Sam Nordfeldt, and Jan Persson. “ADHD from a Socio-Economic Perspective.” Acta Paediatrica 97, no. 2 (February 2008): 239–45. doi:10.1111/j.1651-2227.2007.00611.x. Biederman, Joseph. “Attention-Deficit/Hyperactivity Disorder: A Selective Overview.” Biological Psychiatry 57, no. 11 (June 2005): 1215–20. doi:10.1016/j.biopsych.2004.10.020. Blum, Linda M. Raising Generation Rx: Mothering Kids with Invisible Disabilities in an Age of Inequality. NYU Press, 2015. Blumenthal, David, and Sara R. Collins. Health Care Coverage under the Affordable Care Act—a Progress Report. Mass Medical Soc, 2014. Borrell-Carrió, Francesc, Anthony L. Suchman, and Ronald M. Epstein. “The Biopsychosocial Model 25 Years Later: Principles, Practice, and Scientific Inquiry.” The Annals of Family Medicine 2, no. 6 (2004): 576–82. Cantwell, Dennis P. “Attention Deficit Disorder: A Review of the Past 10 Years.” Journal of the American Academy of Child & Adolescent Psychiatry 35, no. 8 (August 1996): 978–87. doi:10.1097/ 00004583-199608000-00008. Carmona, S., O. Vilarroya, A. Bielsa, V. Tremols, J. C. Soliva, M. Rovira, J. Tomas, C. Raheb, J. D. Gispert, and S. Batlle. “Global and Regional Gray Matter Reductions in ADHD: A Voxel-Based Morphometric Study.” Neuroscience Letters 389, no. 2 (2005): 88–93. Chung, Hyun Jin, Lisa Weyandt, Genevieve Verdi, Anthony Swentosky, Marisa Marraccini, Michael Varejao, Drew Wood, Julia Demagistris, Leah Coffey, and Lindsay Davis. “The Relationship among ADHD Symptomology, Executive Functions, Morality, and Humor.” The ADHD Report 21, no. 7 (2013): 5–9. Crichton, Alexander. An Inquiry into the Nature and Origin of Mental Derangement: Comprehending a Concise System of the Physiology and Pathology of the Human Mind, and a History of the Passions and Effects. Language, Man, and Society. New York: AMS Press, 1976. Cuffe, S. P., C. G. Moore, and R. McKeown. “ADHD and Health Services Utilization in the National Health Interview Survey.” Journal of Attention Disorders 12, no. 4 (April 9, 2008): 330–40. doi:10.1177/1087054708323248. Danforth, Scot, and Virginia Navarro. “Hyper Talk: Sampling the Social Construction of ADHD in Everyday Language.” Anthropology & Education Quarterly 32, no. 2 (2001): 167–90. Denckla, Martha Bridge. “The Myth of ADHD.” Journal of Child Neurology 7, no. 4 (1992): 458–61. Dixon, Marion. “An Arab Spring.” Review of African Political Economy 38, no. 128 (2011): 309–16. Du Paul, George J., Tanya L. Eckert, and Kara E. Mc Goey. “Interventions for Students with Attention-Deficit/Hyperactivity Disorder: One Size Does Not Fit All.” School Psychology Review 26 (1997): 369–81. Engel, George L. “The Need for a New Medical Model: A Challenge for Biomedicine.” Holistic Medicine 4, no. 1 (1989): 37–53. Faraone, Stephen V., Joseph Sergeant, Christopher Gillberg, and Joseph Biederman. “The Worldwide Prevalence of ADHD: Is It an American Condition?” World Psychiatry 2, no. 2 (2003): 104. Farber, Barry A. Crisis in Education: Stress and Burnout in the American Teacher. Jossey-Bass, 1991. Farmer, Paul. “Global Health Equity.” Virtual Mentor 6, no. 4 (2004). ———. Infections and Inequalities: The Modern Plagues. Univ of California Press, 2001. ———. Pathologies of Power: Health, Human Rights, and the New War on the Poor. Vol. 4. Univ of California Press, 2004. ———. “Pathologies of Power: Rethinking Health and Human Rights.” American Journal of Public Health 89, no. 10 (1999): 1486–96. Farmer, Paul, Philippe Bourgois, Nancy ScheperHughes, Didier Fassin, Linda Green, H. K. Heggenhougen, Laurence Kirmayer, Loc Wacquant, and Paul Farmer. “An Anthropology of Structural Violence.” Current Anthropology 45, no. 3 (2004): 305–25. Farmer, Paul, Jim Yong Kim, Arthur Kleinman, and Matthew Basilico. Reimagining Global Health: An Introduction. Vol. 26. Univ of California Press, 2013. Fitzgerald, Michael, Mark Bellgrove, and Michael Gill. Handbook of Attention Deficit Hyperactivity Disorder. John Wiley & Sons, 2007. Foucault, Michel. Discipline and Punish: The Birth of the Prison. 1st American ed. New York: Pantheon Books, 1977. Ghaemi, S. Nassir. The Rise and Fall of the Biopsychosocial Model. RCP, 2009. Goodwin, Marc. “On the Other Side of Hyperactivity: An Anthropology of ADHD,” 2010. Greenberg, Mark T., Roger P. Weissberg, Mary Utne O’brien, Joseph E. Zins, Linda Fredericks, Hank Resnik, and Maurice J. Elias. “Enhancing School-Based Prevention and Youth Development through Coordinated Social, Emotional, and Academic Learning.” American Psychologist 58, no. 6–7 (2003): 466. Greenblatt, James, and Bill Gottlieb. Finally Focused: The Breakthrough Natural Treatment Plan for ADHD That Restores Attention, Minimizes Hyperactivity, and Helps Eliminate Drug Side Effects. First edition. New York: Harmony Books, 2017. Hall, Stuart. “Foucault: Power, Knowledge and Discourse.” Discourse Theory and Practice: A Reader 72 (2001): 81. Hallowell, Edward M., and John J. Ratey. Delivered from Distraction: Getting the Most out of Life with Attention Deficit Disorder. Ballantine Books, 2005. ———. Driven to Distraction. 1st ed. New York: Pantheon Books, 1994. Hellström, Per M. “This Year’s Nobel Prize to Gastroenterology: Robin Warren and Barry Marshall Awarded for Their Discovery of Helicobacter Pylori as Pathogen in the Gastrointestinal Tract.” World Journal of Gastroenterology: WJG 12, no. 19 (2006): 3126. Hinshaw, Stephen P., and Katherine Ellison. ADHD: What Everyone Needs to Know. Oxford ; New York: Oxford University Press, 2016. Hinshaw, Stephen P., Richard M. Scheffler, Brent D. Fulton, Heidi Aase, Tobias Banaschewski, Wenhong Cheng, Paulo Mattos, Arne Holte, Florence Levy, and Avi Sadeh. “International Variation in Treatment Procedures for ADHD: Social Context and Recent Trends.” Psychiatric Services 62, no. 5 (2011): 459–64. Hjörne, Eva, and Roger Säljö. “The Practices of Dealing with Children in Need of Special Support: A Nordic Perspective.” Emotional and Behavioural Difficulties 19, no. 3 (2014): 246–50. Hölttä, Seppo. “Recent Changes in the Finnish Higher Education System.” European Journal of Education 23, no. 1/2 (1988): 91–103. Honkasilta, Juho, E. Sandberg, Vesa Närhi, and Markku Jahnukainen. “ADHD in the Context of Finnish Basic Education.” Emotional and Behavioural Difficulties 19, no. 3 (2014): 311–23. Jarman, Michelle, Sharon Lamp, David Mitchell, Denise Nepveux, Nefertiti Nowell, and Sharon Snyder. “Theorising Disability as Political Subjectivity: Work by the UIC Disability Collective on Political Subjectivities.” Disability & Society 17, no. 5 (2002): 555–69. Jensen, Peter S., Stephen P. Hinshaw, Helena C. Kraemer, Nilantha Lenora, Jeffrey H. Newcorn, Howard B. Abikoff, John S. March, et al. “ADHD Comorbidity Findings From the MTA Study: Comparing Comorbid Subgroups.” Journal of the American Academy of Child & Adolescent Psychiatry 40, no. 2 (February 2001): 147–58. doi:10.1097/00004583-200102000-00009. Jensen, Peter S., Lori Kettle, Margaret T. Roper, Michael T. Sloan, Mina K. Dulcan, Christina Hoven, Hector R. Bird, Jose J. Bauermeister, and Jennifer D. Payne. “Are Stimulants Overprescribed? Treatment of ADHD in Four US Communities.” Journal of the American Academy of Child & Adolescent Psychiatry 38, no. 7 (1999): 797–804. John, Edward P. St, and Jay Noell. “The Effects of Student Financial Aid on Access to Higher Education: An Analysis of Progress with Special Consideration of Minority Enrollment.” Research in Higher Education 30, no. 6 (1989): 563–81. Jones, Colin, and Roy Porter. Reassessing Foucault: Power, Medicine and the Body. Routledge, 2002. Koumoula, A. “The Course of Attention Deficit Hyperactivity Disorder (ADHD) over the Life Span.” Psychiatrike= Psychiatriki 23 (2012): 49–59. Laurence, Jennifer, and David McCallum. “The Myth‐or‐Reality of Attention‐Deficit Disorder: A Genealogical Approach.” Discourse: Studies in the Cultural Politics of Education 19, no. 2 (1998): 183–200. Lloyd, Gwynedd, Joan Stead, and David Cohen. Critical New Perspectives on ADHD. Routledge, 2006. Loe, Irene M., and Heidi M. Feldman. “Academic and Educational Outcomes of Children with ADHD.” Journal of Pediatric Psychology 32, no. 6 (2007): 643–54. Loft, Lisbeth Trille Gylling, and Helene Oldrup. “Social Inequality in Children’s ADHD Diagnosis: Evidence from a Danish Birth Cohort Study,” 2014. Long, Bridget Terry, and Erin Riley. “Financial Aid: A Broken Bridge to College Access?” Harvard Educational Review 77, no. 1 (2007): 39–63. Lou, Hans C., Leif Henriksen, Peter Bruhn, Hanne Børner, and Jytte Bieber Nielsen. “Striatal Dysfunction in Attention Deficit and Hyperkinetic Disorder.” Archives of Neurology 46, no. 1 (1989): 48–52. Madaus, Joseph W., Jennifer S. Kowitt, and Adam R. Lalor. “The Higher Education Opportunity Act: Impact on Students with Disabilities.” Rehabilitation Research, Policy, and Education 26, no. 1 (2012): 33–41. Martinez-Badía, Jose, and Jose Martinez-Raga. “Who Says This Is a Modern Disorder? The Early History of Attention Deficit Hyperactivity Disorder.” World Journal of Psychiatry 5, no. 4 (2015): 379. Marx, Karl. “Das Kapital, Bd. 1.” MEW, Bd 23 (1867): 405. Mate, Gabor. Scattered Minds: The Origins and Healing of Attention Deficit Disorder. Vintage Canada, 2011. Mather, Barbara A. “The Social Construction and Reframing of Attention-Deficit/Hyperactivity Disorder.” Ethical Human Psychology and Psychiatry 14, no. 1 (2012): 15–26. Mayer, John D., and Glenn Geher. “Emotional Intelligence and the Identification of Emotion.” Intelligence 22, no. 2 (1996): 89–113. McLeod, Saul A. “Bandura-Social Learning Theory.” Retrieved from, 2011. Mechanic, David. “Seizing Opportunities under the Affordable Care Act for Transforming the Mental and Behavioral Health System.” Health Affairs 31, no. 2 (2012): 376–82. Meerman, Sanne te, Laura Batstra, Hans Grietens, and Allen Frances. “ADHD: A Critical Update for Educational Professionals.” International Journal of Qualitative Studies on Health and Well-Being 12, no. sup1 (2017): 1298267. Mégraud, Francis. “A Humble Bacterium Sweeps This Year’s Nobel Prize.” Cell 123, no. 6 (2005): 975–76. Nezu, Arthur M., Christine M. Nezu, and Sonia E. Blissett. “Sense of Humor as a Moderator of the Relation between Stressful Events and Psychological Distress: A Prospective Analysis.” Journal of Personality and Social Psychology 54, no. 3 (1988): 520. Nichols, Sharon L., and David C. Berliner. Collateral Damage: How High-Stakes Testing Corrupts America’s Schools. ERIC, 2007. Niesche, Richard. “What Use Is Foucault in Education Today?” Journal of Educational Administration and History 48, no. 1 (January 2, 2016): 113–18. doi:10.1080/00220620.2015.1034575. Oldrup, Helene, and Lisbeth Trille G. Loft. “ADHD: The Role of Social Inequality in Diagnosis.” In Future Challenges for Health and Healthcare in Europe, 155–80. Aalborg Universitetsforlag, 2016. Organization, World Health. The ICD-10 Classification of Mental and Behavioural Disorders: Clinical Descriptions and Diagnostic Guidelines. Vol. 1. World Health Organization, 1992. ———. The World Health Report 2000: Health Systems: Improving Performance. World Health Organization, 2000. ———. The World Health Report 2006: Working Together for Health. World Health Organization, 2006. Overmeyer, S., E. T. Bullmore, J. Suckling, A. Simmons, S. C. R. Williams, P. J. Santosh, and E. Taylor. “Distributed Grey and White Matter Deficits in Hyperkinetic Disorder: MRI Evidence for Anatomical Abnormality in an Attentional Network.” Psychological Medicine 31, no. 8 (2001): 1425–35. Panksepp, Jaak. “Can PLAY Diminish ADHD and Facilitate the Construction of the Social Brain?” Journal of the Canadian Academy of Child and Adolescent Psychiatry 16, no. 2 (2007): 57. Piketty, Thomas. Capital in the Twenty-First Century. Harvard University Press, 2017. ———. “Social Mobility and Redistributive Politics.” The Quarterly Journal of Economics 110, no. 3 (1995): 551–84. Piketty, Thomas, and Emmanuel Saez. “Income Inequality in the United States, 1913–1998.” The Quarterly Journal of Economics 118, no. 1 (2003): 1–41. Prosser, Brenton. “The Impact of Economic Inequality on Attention Deficit Hyperactivity Disorder: An Australian-American Comparison,” n.d.
Protection, Patient, and Affordable Care Act. “Patient Protection and Affordable Care Act.” Public Law 111, no. 148 (2010): 1. Prouser, Ora Horn. Esau’s Blessing: How the Bible Embraces Those with Special Needs. Teaneck, N.J: Ben Yehuda Press, 2011. Puryear, Douglas A, and Juan Antonio Villalobos. Your Life Can Be Better: Using Strategies for Adult ADD/ADHD. Minneapolis, MN: Mill City Press, 2012. Rafalovich, Adam. “Disciplining Domesticity: Framing the ADHD Parent and Child.” The Sociological Quarterly 42, no. 3 (2001): 373–93. Rauws, E. A. J., and G. N. J. Tytgat. “Cure of Duodenal Ulcer Associated with Eradication of Helicobacter Pylori.” The Lancet 335, no. 8700 (1990): 1233–35. Raviola, Giuseppe, Anne E. Becker, and Paul Farmer. “A Global Scope for Global Health—including Mental Health.” The Lancet 378, no. 9803 (2011): 1613–15. Remschmidt, Helmut. “Global Consensus on ADHD/HKD.” European Child & Adolescent Psychiatry 14, no. 3 (2005): 127–37. Rhea, Debbie. “Give Students Time to Play.” Education Week 33, no. 22 (2014): 20–21. Robb, Jessica A., Margaret H. Sibley, William E. Pelham, E. Michael Foster, Brooke SG Molina, Elizabeth M. Gnagy, and Aparajita B. Kuriyan. “The Estimated Annual Cost of ADHD to the US Education System.” School Mental Health 3, no. 3 (2011): 169–77. Rowland, Andrew S., Catherine A. Lesesne, and Ann J. Abramowitz. “The Epidemiology of Attention‐deficit/Hyperactivity Disorder (ADHD): A Public Health View.” Developmental Disabilities Research Reviews 8, no. 3 (2002): 162–70. Scheffler, Richard M., Stephen P. Hinshaw, Sepideh Modrek, and Peter Levine. “The Global Market for ADHD Medications.” Health Affairs 26, no. 2 (2007): 450–57. Schwarz, Alan. ADHD Nation: Children, Doctors, Big Pharma, and the Making of an American Epidemic. First Scribner hardcover edition. New York: Scribner, 2016. ———. “Risky Rise of the Good-Grade Pill.” The New York Times, 2012, A1. ———. “The Selling of Attention Deficit Disorder.” New York Times 14 (2013). Stevens, Jack, Jeffrey S. Harman, and Kelly J. Kelleher. “Race/Ethnicity and Insurance Status as Factors Associated with ADHD Treatment Patterns.” Journal of Child & Adolescent Psychopharmacology 15, no. 1 (2005): 88–96. Stolzer, Jeanne. “ADHD in America: A Bioecological Analysis.” Ethical Human Sciences and Services 7, no. 1 (2005): 65–75. Strydom, Jan, and Susan Du Plessis. The Myth of ADHD and Other Learning Disabilities: Parenting without Ritalin. Huntington House, 2001. Stubbe, D. E. “Attention-Deficit/Hyperactivity Disorder Overview. Historical Perspective, Current Controversies, and Future Directions.” Child and Adolescent Psychiatric Clinics of North America 9, no. 3 (July 2000): 469–479, v.
Swanson, James, F. Xavier Castellanos, Michael Murias, Gerald LaHoste, and James Kennedy. “Cognitive Neuroscience of Attention Deficit Hyperactivity Disorder and Hyperkinetic Disorder.” Current Opinion in Neurobiology 8, no. 2 (1998): 263–71. Tabassam, Waheeda, and Jessica Grainger. “Self-Concept, Attributional Style and Self-Efficacy Beliefs of Students with Learning Disabilities with and without Attention Deficit Hyperactivity Disorder.” Learning Disability Quarterly 25, no. 2 (2002): 141–51. Taylor, Eric. “Antecedents of ADHD: A Historical Account of Diagnostic Concepts.” ADHD Attention Deficit and Hyperactivity Disorders 3, no. 2 (June 2011): 69–75. doi:10.1007/s12402-010-0051-x. Taylor, Eric, J. Sergeant, M. Doepfner, B. Gunning, S. Overmeyer, H.-J. Möbius, and H.-G. Eisert. “Clinical Guidelines for Hyperkinetic Disorder.” European Child & Adolescent Psychiatry 7, no. 4 (1998): 184–200. Telzrow, Cathy F. “IDEA Amendments of 1997: Promise or Pitfall for Special Education Reform?” Journal of School Psychology 37, no. 1 (1999): 7–28. Timimi, Sami, and Jonathan Leo. Rethinking ADHD: From Brain to Culture. Palgrave Macmillan, 2009. Timimi, Sami, and Eric Taylor. “ADHD Is Best Understood as a Cultural Construct.” The British Journal of Psychiatry 184, no. 1 (2004): 8–9. Tripp, Gail, Siu L. Luk, Elizabeth A. Schaughency, and Rajiv Singh. “DSM-IV and ICD-10: A Comparison of the Correlates of ADHD and Hyperkinetic Disorder.” Journal of the American Academy of Child & Adolescent Psychiatry 38, no. 2 (1999): 156–64. Uusitalo-Malmivaara, Lotta. “Global and School-Related Happiness in Finnish Children.” Journal of Happiness Studies 13, no. 4 (August 2012): 601–19. doi:10.1007/s10902-011-9282-6. Visser, Susanna N., Melissa L. Danielson, Rebecca H. Bitsko, Joseph R. Holbrook, Michael D. Kogan, Reem M. Ghandour, Ruth Perou, and Stephen J. Blumberg. “Trends in the Parent-Report of Health Care Provider-Diagnosed and Medicated Attention-Deficit/Hyperactivity Disorder: United States, 2003–2011.” Journal of the American Academy of Child & Adolescent Psychiatry 53, no. 1 (January 2014): 34–46.e2. doi:10.1016/j.jaac.2013.09.001. Wolf, Lorraine E. “College Students with ADHD and Other Hidden Disabilities.” Annals of the New York Academy of Sciences 931, no. 1 (2001): 385–95. Yli-Piipari, Sami, Janne Santeri Kulmala, Timo Jaakkola, Harto Hakonen, Joseph Cole Fish, and Tuija Tammelin. “Objectively Measured School Day Physical Activity among Elementary Students in the United States and Finland.” Journal of Physical Activity and Health 13, no. 4 (2016): 440–46. Ysseldyke, James E., Bob Algozzine, and Martha Thurlow. Critical Issues in Special Education. Kanishka Publishers, 1998. Zimmerman, Barry J. “Self-Efficacy: An Essential Motive to Learn.” Contemporary Educational Psychology 25, no. 1 (2000): 82–91. Zins, Joseph E. Building Academic Success on Social and Emotional Learning: What Does the Research Say? Teachers College Press, 2004. Zoega, Helga, Karl Furu, Matthias Halldórsson, Per Hove Thomsen, Andre Sourander, and Jaana E. Martikainen. “Use of ADHD Drugs in the Nordic Countries: A Population‐based Comparison Study.” Acta Psychiatrica Scandinavica 123, no. 5 (2011): 360–67. Zylowska, L., S. L. Smalley, and J. M. Schwartz. “Mindful Awareness and ADHD.” In Clinical Handbook of Mindfulness, 319–38. Springer, 2009.